I'm not sure of their numbers, but South Africa has plenty of ostriches. In fact, it's normally pretty easy to find in local supermarkets, and you'll regularly see Ostrich Fillet on restaurant menus. In case you're curious - ostrich fillet is pretty tender, it looks a lot like beef, except that it's slightly darker in colour and you will likely never see fat on the meat. Ostrich is in fact one of the healthiest meats with a fat content lower than that of skinless chicken or turkey, and high in protein and iron. Posted in General on Saturday, 10 April, 2010 by Paul. 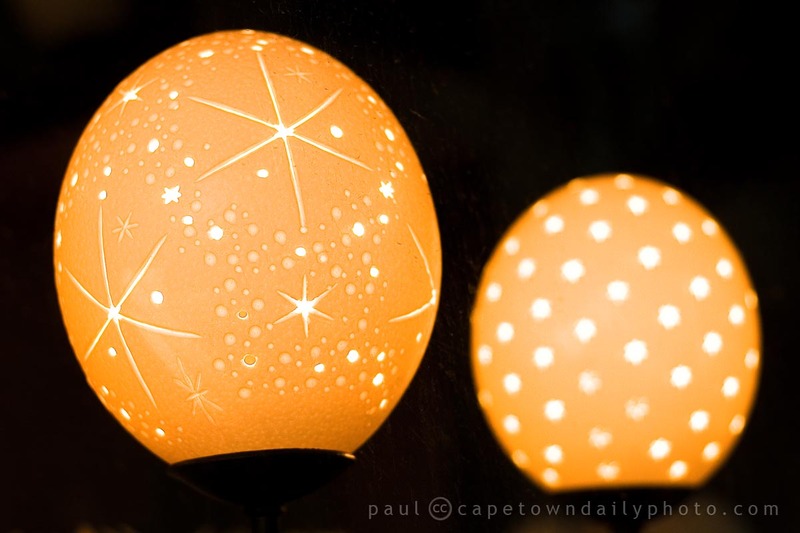 Don’t they make for such pretty lights, maybe one day I’ll try and bring one back from our visit to CT.. Imagine having these as garden lights Bev? They’re pretty, but I wouldn’t have them in my house I don’t think. But, in the garden… they’d be awesome! I miss eating ostrich meat – we often ate it instead of red meat in South Africa (which means we only ate red meat 5 times a week with another night off for chicken). Okay, maybe that is an exaggeration but I’ve had to make a concerted effort to eat red meat occasionally in this country as my iron is down. Aren’t guavas and beetroot also very high in iron? Hi Natalie, I’m not sure – but perhaps you could contact Tina Shirling from Deco Gecko – she does some kind of craft using ostrich eggs. Alternatively, there is an ostrich farm on the N7 – between Blouberg and Melkbos I think – there’s a huge sign on the left when traveling in the direction of Cape Town that reads “Shhh… ostriches being laid”. I’ve also spotted ostriches in a field on the road in Durbanville that leads to the Fair Cape farm… perhaps you could inquire there. Oh, and Natalie, I just noticed that I never mentioned where this photo was taken. I took it through the window of a shop at the V&A Waterfront – next door to Cape Union Mart, close to the Wheel of Excellence.